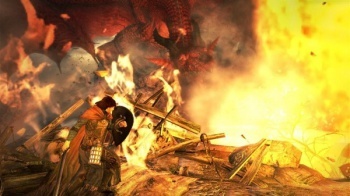 Capcom reckons Dragon's Dogma will be popular - like "10 million sales" popular. "I don't know if other Japanese developers are trying to become more global, but I know we definitely are," producer, Hideaki Itsuno, told Videogamer. "It's difficult, because we really want this game to sell 10 million units worldwide. We want to sell a lot, and that's just something that we think we can do. We're not positive [it will be a success]. Of course it's a risk, but that's what we want - a challenge." Considering Dragon's Dogma is a new IP and Capcom are contended with all kinds of PR woes at the moment, ten million sales seems a bit optimistic. Itsuno reckons at least one million of those sales will take place in Japan. "But in Japan, we can absolutely sell a million units. We know that's attainable, it's absolutely do-able. We have a kind of assurance that that will happen, but for worldwide that's not so much the case, and I think that's why a lot of Japanese developers are hesitant about going global. It's because they don't have that assurance that it'll be successful." To put that number in perspective: Similar open-world RPG, Skyrim, which was the first western game to receive a perfect score from picky gaming mag, Famitsu, has clocked up less than half a million sales since it was released last December. Dragon's Dogma is being developed by Capcom's largest ever development team, helmed by Devil Mary Cry 4 producer, Hiroyuki Kobayashi, and director, Hideaki Itsuno. It's due for release on the 25th of May for PlayStation 3 and Xbox 360.